Dr. Hussain Rasheed Hassan was appointed as the Minister of Environment on the 17th of November 2018, following the inauguration of the new administration of President H.E. Ibrahim Mohamed Solih. The new Minister is responsible for the conservation of the natural environment, water resources and energy sources in the Maldives. 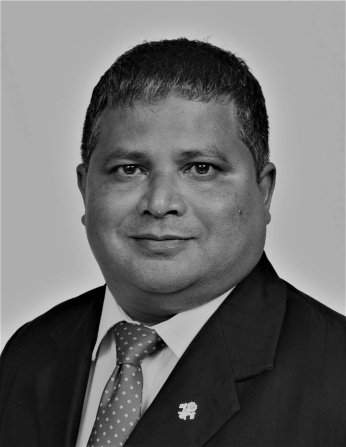 During the previous administration (November 2013 to November 2018), Dr. Hussain worked with the joint opposition coalition, in his capacity as a Deputy Leader of Republican (Jumhooree) Party of the Maldives, a post he has held since May 2012. Dr. Hussain served as a Minister of State for Fisheries and Agriculture under President Mohamed Nasheed, as well as President Dr Mohamed Waheed Hassan (from November 2008 to November 2013), with the mandate of overseeing the management and development of the fisheries sector in the Maldives. The newly appointed Minister of Environment commenced public service in 1986. Since then, he has served in various government posts at the Ministry of Fisheries and Agriculture and the Ministry of Human Resources, Employment and Labour, before being elected as a Member of the People’s Special Majlis (a special plenary of the Maldives parliament), which was convened in June 2004 to amend the Constitution of the Maldives. Dr. Hussain completed his undergraduate studies at the Australian Maritime College in the field Fisheries Sciences and Management. He completed his Masters, with distinction, in the field of Fisheries Economics before going on to attain a Doctorate of Philosophy in International Production and Trade in Principle Market Tunas, from the University of Portsmouth, UK. As an academic, Dr. Hussain’s services have been acknowledged in the Maldives and overseas. In this regard, he worked as a researcher and as a lecturer at the University of Portsmouth, between 1997 and 2001, and he served as the President of the College Council of the Kulliyathul Dhiraasathul Islamiyya (College of Islamic Studies, which is now the Islamic University of Maldives) between June 2011 and November 2013.